D.P. 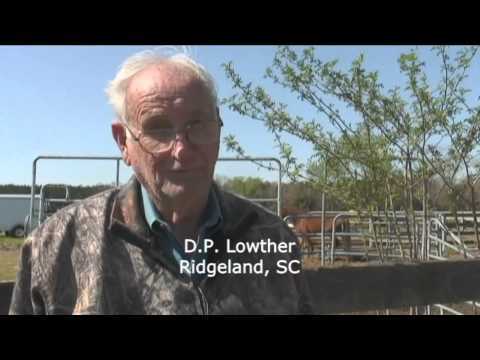 Lowther owns the largest herd of marsh tacky horses in the United States. CLAIMS TO FAME: Owns the largest herd of marsh tacky horses in the United States. Lowther helped found the Carolina Marsh Tacky Association in 2007 to preserve the breed and now serves as its president for a second time. “You could ride some of these horses all day long in the bushes and briars and swamps, and they would never break a sweat,” he says. Lowther fell in love with the breed as a boy, when his father, a cow farmer and mule trader, acquired a handful. Daily, Lowther rode the sturdy, easy-tempered horses while herding cows. As a young man, he rode out to the state’s coastal islands, where feral marsh tackies ran free but neglected, dwindling toward extinction, and brought them home on barges. Now Lowther is widely credited for preserving the survival and integrity of the breed. Only about 300 registered Carolina marsh tackies exist in the country, and Lowther owns nearly a third of them. Named the state heritage horse in 2010, marsh tackies are part of S.C. history. And Lowther is inextricably tied to the breed’s history. “The love for horses is like being an alcoholic—it gets in your blood, and you can’t get it out. It’s the love of my life,” he says. To learn more about the Carolina marsh tacky, including where to buy or see the horses, visit the Carolina Marsh Tacky Association website. i can no longer ride a horse but sure would love to take pictures of them. I owned one as a kid and knew many more growing up in Georgetown County. back when they were as common as flies in the lowcountry summer. Thinking about starting my own herd. Would love to get in touch with Mr. Lowther.